The best square trampolines for 2019 are a sweet spot between round and rectangular tramps in regard to performance. These models tend to offer around 20% more usable surface compared to a round trampoline of the same size. They are also slightly bouncier than round tramps but not to levels that might make them unsafe for kids as it’s the case with most rectangular models. In addition, credit to the symmetric design of a square trampoline, it’s easy to place and use it near obstacles and corners, and it does not waste so much space. Since you are here, let’s take you through our recommendations of the best square trampoline for sale this year. Are square trampolines any good? What should you consider when purchasing a square trampoline for family? Skywalker is synonymous with great trampolines and it’s actually one of the best trampoline brands to consider this year. For those who might not be familiar with it, just know that this manufacturer is popular for its affordable and above-average quality fun tools. What we have in this department is the Skywalker 15ft square trampoline which is currently one of the most sought-after square tramps in the market. While it has several eye-catching features worth raving about, it’s the quality of construction that caught our attention first. This trampoline’s frame and legs have been crafted from a 16-gauge extra thick rust-resistant galvanized steel tube. To be more precise, the tube used here is 2.4 inches wide in diameter and 0.06 inches (1.5mm) thick. These dimensions make it amazingly sturdy and stable and this adds to its safety and durability aspects. Still on the construction details, the enclosure poles of this square trampoline are secured on the frame by Skywalker’s welded T-socket which strengthens each joint by preventing twisting. Again, the polypropylene mat and polyethylene net are 100% sun and weather-resistant. These materials together with the rust-resistant frame and legs allow you to leave the trampoline erected in your backyard throughout the year. Another feature worth of mention is the stay-put enclosure net that connects directly to the jumping mat for a no-gap jumping surface. The Skywalker Trampolines 15ft Square trampoline has a total jumping surface of 172 sq.ft. which is much higher than what a 15ft round trampoline offers. This enormous playing surface coupled with the 300-pound weight limit means that it can withstand multiple kids jumping at once and most adults too. There’s no doubting that the Springfree trampoline 11ft S113 is pricey compared to other standard alternatives in these square trampoline reviews. But it’s nothing much than you’d want to pay for the safest square trampoline in the world. Springfree trampolines pride themselves on their ‘spring-free’ construction design that eliminates the key danger zones that plague spring-based tramps. In place of the springs, a Springfree trampoline is fitted with flexible rods with the frame located far below the mat. This means 2 things: first, there is absolutely no risk that your kids will ever have their feet and hands bruised, cut, or scrapped by springs that weren’t properly padded. Second, the risk of the jumpers slamming their head on hard edges when stunts go wrong is highly reduced since the frame just can’t be reached. The S113 Springfree trampoline is 11ft by 11ft and offers a total jumping surface of 113 sq.ft. While this is notably smaller than what the 15’ square trampoline above offers, the jumping surface is still enormous especially considering that the mat is usable from edge to edge. This trampoline has a jumper’s weight capacity of 220 pounds and a structural load capacity of 1100 pounds. The latter refers to the highest weight that the mat and general skeleton of the tramp can withstand. But it’s advisable to remain within the manufacturer-recommended single jumper weight limit for safety reasons. Moving from a large square trampoline to one of the smallest models that you’ll come across today, enter the Skywalker 33 inch square mini jumper trampoline. This model is for parents and caregivers who want to keep their youngsters engaged and fit at the same time without spending too much. Considering its size, this is also an ideal alternative if you don’t have enough space to set an enormous bouncy plaything at your yard. This small square trampoline with handlebar will fit in almost any room in the house and it’s also less demanding in terms of storage. This size and lightweight design (around 20 pounds) also allow you to take the fun outside and indoors when the weather won’t allow outdoor enjoyment. The Skywalker Trampolines 36 inch has 4 2-in-1 legs. Each of these legs has been angled to boost stability and also has a rubber cap to protect your carpet and floors. On the same note, the legs and frame are made of 16 gauge stainless steel that makes the trampoline strong enough to support the 60-pound manufacturer recommended weight capacity. As opposed to using the traditional spring system, this trampoline is fitted with 32 stretch bands that are just as bouncy but with reduced risk of catching small fingers and feet. The stretch bands are again covered with a soft pad to make them even safer. Worth mentioning, these stretch bands mean that the tramp does not squeak at all compared to a traditional spring-based rebounder. This is very practical for those times when your small ball of energy wants to have a ride in the living room. As you’d expect for a small square trampoline for kids, this model comes with a padded handlebar for added stability. But what your kid will really love is the interactive console that keeps track of the number of jumps and also congratulates them after every 10 jumps on a specific spot on the polypropylene mat. This 14ft Skywalker square trampoline is among the latest releases from this brand, and anyone who has used it will tell you that it’s one of the best trampolines for a family of gymnasts. This model is a little bit smaller than its sibling, the 15ft Skywalker but as it’s usually the case with square trampolines, it offers a jumping surface almost equal to that of a 16-inch round trampoline. This means that your family gets an enormous playing surface without the trampoline grabbing all the available space at your backyard. True to Skywalker’s tradition, this 14ft square trampoline uses a thick galvanized steel tube for the frame and legs for optimum stability. The construction design also incorporates a t-socket through which the frame and legs interlock to prevent wiggling and to make the entire rig even more stable. As far as your family’s safety is concerned, this trampoline ticks almost all the boxes that really matter; a polyethylene net that attaches directly to the mat, a good enclosure height to keep everyone inside, a hard-to-forget zippered doorway, and a nicely padded spring system. This trampoline is among the bounciest square trampolines on the market today too thanks to its 96 thick steel springs. 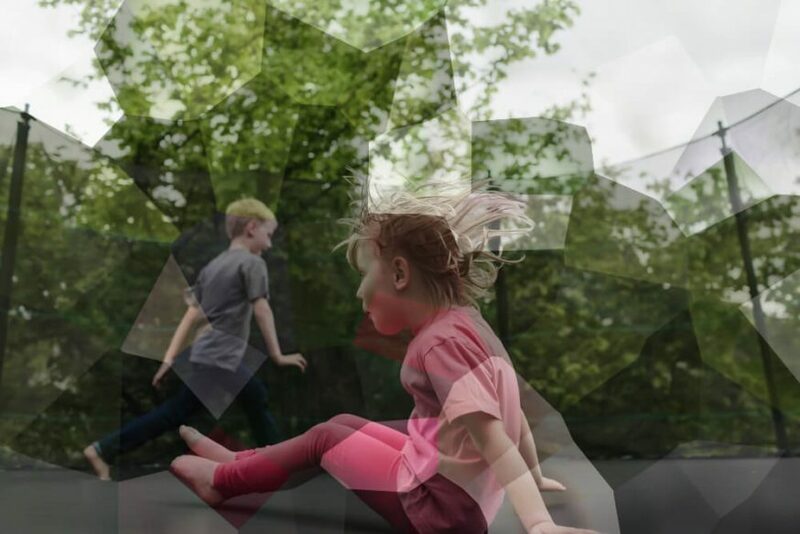 A great alternative to the Skywalker Trampolines 36’’ Jump and Count that we saw earlier, the Galt is yet another one of the best square trampolines for kids. This might be your go-to model if you feel that your kid is not big enough yet for an adult-size tramp. It’s also a good choice for parents who are hunting for an affordable square trampoline for kids. The Galt is pretty much similar to the Skywalker on almost all fronts, only that it is 2 inches smaller and a lot cheaper. Boasting a weight capacity of 55 pounds, the Galt is a child-friendly model with a bright-colored welcoming design and a lot of safety features. The legs, for instance, are angled to prevent the tramp from tipping over even with the jumpiest kids. The frame and legs have also been powder-coated to prevent early rusting. As its title suggests, what gives the Galt a competitive edge when compared to other models of its type is its folding legs. This design makes storage a lot easier and it also makes it possible to carry the tramp in and outside the house without lots of stress. Well, all trampolines (round, rectangle, oval, and square) have their strengths and weaknesses. Round trampolines, for instance, are the most popular and easy to find and the most affordable too. But they tend to take a lot of space wherever they are placed. Rectangular trampolines, on the other hand, are great for long but narrow backyards. They also offer the best bounce thereby taking the upper hand in terms of popularity with gymnasts. But they are the priciest. Square outdoor trampolines combine the strengths of round and rectangular trampolines to offer you a play tool with tons of fun and that which is much safer and easy to manage too. The temptation to get the biggest trampoline available is always overwhelming. But at times, big isn’t always the best. The ideal size for your trampoline depends on the intended user and the amount of space available for it. For instance, a 36 inch square mini jumper trampoline may be just what your preschooler needs. If you are buying the tramp for a family of jumpers though, a model that measures 13-15 feet might be worth checking out. Of course, you want to buy a trampoline that will withstand the weight of the intended users. Most square trampolines for adults will support over 200lbs with others getting as high as 500+ pounds. A high weight capacity tramp allows multiple jumpers to have a ride on the mat at the same time which (although not recommendable) adds a lot of fun. Trampoline safety is a broad topic that starts right from the quality of construction to how the tramp is used. Consider the stability and sturdiness of the trampoline. The size and thickness of the tubes used for the legs and frame and how the 2 connect to each other are good telltales of whether or not the trampoline will be sturdy. In addition, consider the quality of the materials used for the mat and net. Trampolines mats made from polypropylene and polyethylene nets are the best. However, it’s good to consider any additional construction details that make the 2 more durable and resistance to weather elements such as UV treatment. Adding a trampoline to your backyard is a great way to bring fun to the whole family. Actually, we are yet to come across anyone who would honestly say no the giddy thrill that comes with jumping on one- including both the young and the old. The best square trampolines for 2019 now incorporate tons of safety features to put your mind at ease, while still maintaining the fun that these playthings are known for. If you’ve made up your mind to go with these models, we believe you’ll find the best square trampoline from our collection above.